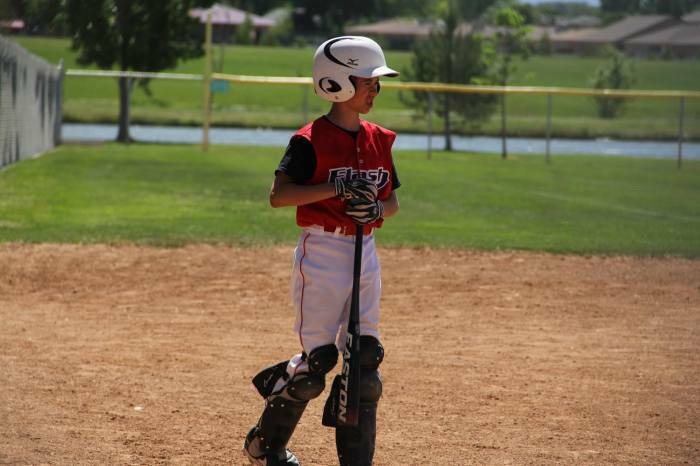 The above video was originally posted in the Power Hitters Club members area. The “Ask Jon” segment is for members only, with Jon answering member questions in the form of a video. This is a story I love to tell. While the video above does a good job of summarizing in about seven minutes, I wanted to write out a more detailed story. On August 18, 2011, I was laid off for the second time in under three years. Beginning in the summer of 2008, I left (crazily under my own will) a dream job with the NBA. It actually wasn’t that crazy because we wanted to return to our quiet life in Colorado, and New Jersey was far from quiet. But I had no idea the risk I was taking by leaving a job that provided so much security and entertainment for three eventful seasons. I first worked for a start-up fantasy games development company. This was a natural transition since I oversaw fantasy games for the NBA. That lasted six months before I was laid off. After doing some consulting for a few months, I accepted an opportunity to be VP of Strategic Marketing for the American Cancer Society. Tough time to take an experimental position for a non-profit, right as the economy was about to tank. That led me to my second layoff in the fall of 2011. One reason I left the NBA was because while I loved the job, it separated me from my family. I often spent two hours per day commuting, and I worked long hours. 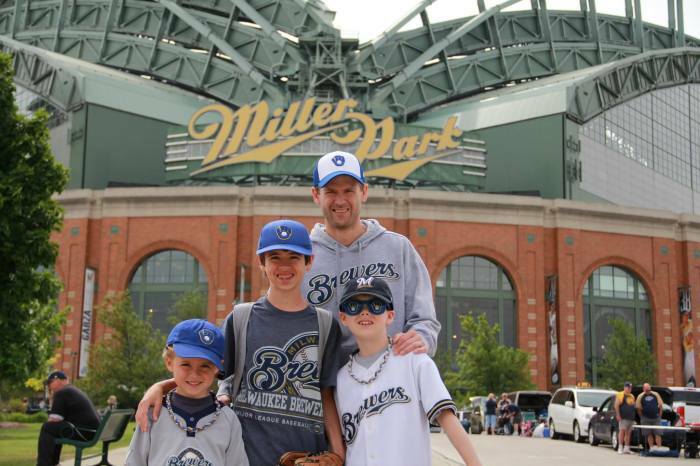 Though I loved every minute of it, taking the job was a selfish move (we pulled up roots from Colorado so I could take the job), and the time away from family conflicted with my core values. Back in 2003, our oldest son was diagnosed with neuroblastoma, a rare form of childhood cancer. The prognosis is not typically good, but he was one of the lucky ones. Now 11 years later, Michael is a happy, healthy and AMAZING 13-year-old boy. But that experience has a way of changing your priorities. I suddenly saw new value in every second of the day. Anytime spent in traffic was time wasted. I wanted to spend more time with my kids. See them grow. Coach their baseball teams. But these things were impossible with a commute. Before the NBA job and soon after Michael’s diagnosis, I took a job closer to home so that my commute was no more than two minutes. It was the perfect situation. So when I became jobless, I knew what I wanted and what I didn’t want. I wasn’t going to move my family again. And I wasn’t going to take a job downtown. That, of course, limited my options. There was very little I could do close by in the ‘burbs of my neighborhood. I could get back into consulting (which I would do for a while). Or I could start my own business (which seemed insane). While with the NBA in 2007, we partnered with this up-and-coming company called Facebook. I had no exposure to it otherwise. A young employee once tried — unsuccessfully — to help me understand what Facebook was and convince me to do something with them. But luckily someone else was listening and set up the partnership. We partnered with Facebook to build an NBA Playoffs application, before you could create your own apps. Facebook just repurposed their March Madness app that was so successful for their college crowd. I was also the first (or one of the first) admin for an NBA Facebook group — before there were pages. Yeah, that makes me feel really old. Needless to say, I fell in love with the platform. I was amazed by being able to reconnect with so many people I hadn’t heard from in over 20 years. I became an immediate Facebook addict. I was comfortable with Facebook as a user, and I also had the experience of using Facebook for a brand dating back to the earliest stages of brands on Facebook. I’d like to say that when I was laid off, I immediately started a thriving business. That I was well-trained and prepared and knew exactly what I needed to do. I had no freaking clue. The one thing I did know how to do — and enjoyed — was write. So I started a very basic website (built on a free theme) and started writing. I wrote a lot, though I didn’t hit a routine until the start of 2012. Beginning then, I started writing nearly every day of the week. I wrote and I wrote and I wrote. I wrote more than 300 blog posts in that first year. I lacked focused during the first six months, but I started writing mainly about Facebook marketing beginning the end of February in 2012. But it was far from a business. It was a way to get my name out there and keep myself busy. And really, I was far from busy. I made no money for four months. Nothing at all. And when I started making some money for my site with AdSense and affiliates, we’re not talking about a business here. I was bringing in a few hundred dollars (maybe $1,000) per month. Eventually I would do some consulting. But I didn’t start bringing in any true revenue through the site (sponsors and products) until the end of 2012 — a year after the journey began. 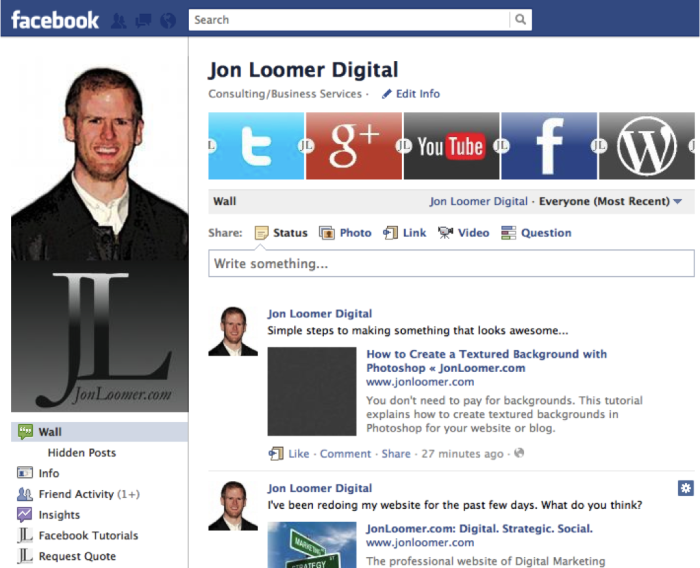 When I started my website, you may be surprised that I didn’t immediately start a Facebook page. Well, keep in mind that I didn’t see myself as a business, so that wasn’t high on the priority list. In fact, I was a bit uncomfortable even when I started my page. I didn’t truly have a business yet, and I felt like self-branded Facebook pages were only for celebrities. But I created a Facebook page anyway, and committed to it. I had to be committed because it was a freaking ghost town at first. I invited all of my friends and family first (big mistake), and people quickly got bored of my content. I wrote 39 posts in the first month, and 26 never received a single like, comment or share. It got so pathetic that I recorded a “thank you” video for my fans to celebrate the milestone of reaching 65 likes. Yeah, a milestone! Well, guess what? Not one person commented on, liked or shared that video when it was initially released. I didn’t quit, though. I had nothing better to do, so I carried on. I used my Facebook page to share my content, but also to educate my target audience. 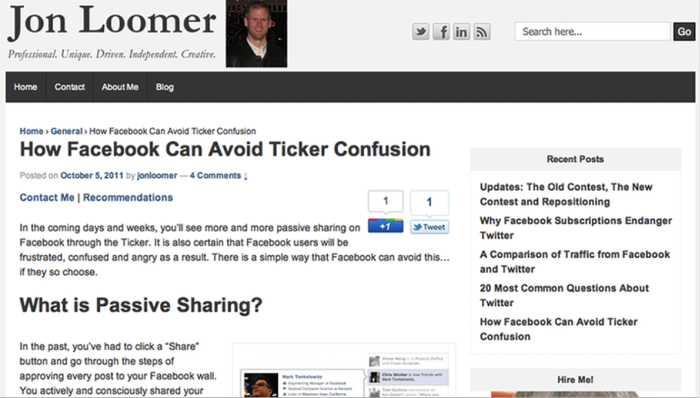 I’d typically share my blog posts as well as articles from others to provide value. Facebook ads were part of my strategy, but they certainly weren’t at the top of the list. I had no money. In fact, we were quickly falling into debt. So if I wasn’t running free ads from a coupon I dug up, I was running ads for $1 per day. In the first year or so, my priority was simply finding people who would listen. I ran ads at a low level to build my audience, and I shared blog posts to drive traffic. Of course, as revenues started to increase and Facebook’s advertising power improved, I began investing more and more into Facebook ads. I now spend double on Facebook ads in one month what I spent in that entire first year. I still use Facebook ads to build my audience. Relevance is key, of course, because fans convert. So I’m always focused on attracting those who already know me to my page first. Every new blog post is also promoted to my fans and my website visitors. This helps increase my website traffic. And by increasing my website traffic, the pool of people who know me and I can target later grows. Facebook ads have also served an important role in building my email list. Whether it was giving away an ebook or running a free webinar, I would run ads on Facebook to build that ever-important list. And of course, Facebook has been a big part of growing revenue. There are certainly indirect results from simply building a large, engaged audience. But I also use ads to target fans, website visitors and those who have abandoned my landing pages to drive sales. I learned plenty here. I learned that how Facebook works and doesn’t work is largely common sense. People are on Facebook to chat with their friends and family. 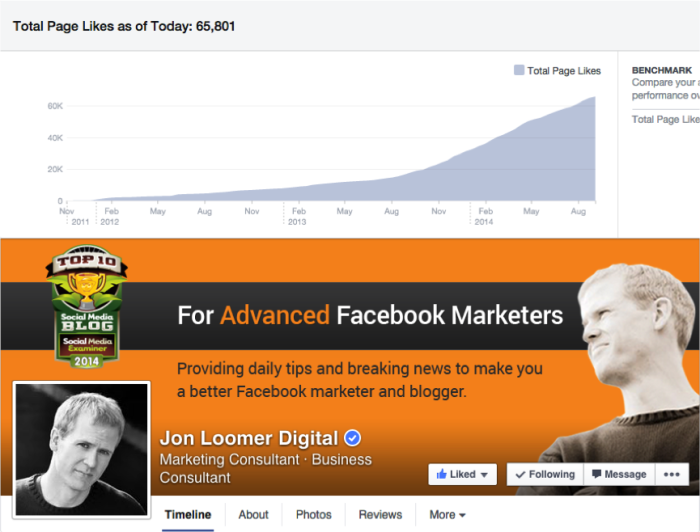 While they may have liked your page, they usually don’t care that much whether or not they see your content. And people on Facebook don’t like being interrupted by sleazy sales pitches from people they don’t know. These ads stick out like a sore thumb. And it makes perfect sense why they don’t work. That’s why I focus primarily on reaching and selling to those who already know me. Through a four-step sales funnel, they already trust me. So they are less likely to be put off by a sales pitch, and are far more likely to buy. As I look back on these past three years, I find it hard to believe how far this business has come. It went from not really being a business at all to a revenue-generating machine. But it certainly didn’t happen overnight. Niche Focus: Today, I’m seen as the “Facebook Ads Guy.” If you have a question about Facebook ads or Power Editor — or specifically about advanced Facebook advertising — you likely come to my site. This happens because of years of work building that brand and authority. I initially cast a wide net, trying to be everything for everybody. And then even when I focused on Facebook marketing, I was doing what countless others were doing just as well. But there was a need. No one was talking about advanced Facebook marketing topics. And beyond the beginner subjects of building likes and boosting posts, very few people were writing about ads. Writing about advanced Facebook advertising was more than just realizing a need. It was taking advantage of an opportunity. It took me a while, but picking this group made a whole lot of sense. I could write generally about Facebook marketing, but that attracted beginners and people who refused to spend a dime on Facebook ads. By writing about advanced Facebook advertising topics, I was catering to people who were already investing in their business. These people would be willing to spend money to make sure they weren’t wasting their investment. Writing A LOT: This was critical. Today, Google drives an insane amount of traffic to my site. Even though I now write only one post per week, I still get 8-10k referrals from Google on a typical day. This happened because of all of that writing early on about a very focused topic. Over and over again. I trained Google to see my site as the go-to source for Facebook marketing. I am not an SEO guy. There were no tricks. I just wrote a ton of content about a single topic. Marcus Sheridan was my guide here. Through reading his content, I learned to write content that answers the questions of my target audience. That approach simply works. Experimenting: Hugely important for someone like me who had no clue what he was doing. I’ve tried so many things in three years. Many of those experiments failed. But you won’t find what works without failing a few hundred times first. List Building: Stupidly, I didn’t start an email list until my website was about six months old. But it’s the lifeblood of my business. While I’ve given away ebooks and run webinars in the past, I’ve largely built my list through a very simple “subscribe to my newsletter” approach. It’s a lazy approach, but when you get the type of traffic I’ve been getting, it works. Still, it’s become painfully clear that opportunities were missed here. So I’ve begun putting more focus on list building and lead generation. You’ll see this with my new Power Editor ebook (opt-in forms everywhere!) and image dimensions PDF. I now get several hundred new email addresses added to my list every day. Products: That list is what drives sales. But first you need something to sell! My first products were awful. I set up a “Facebook Page Review” service that was way underpriced and didn’t scale. I had a small group workshop that was again underpriced. But they were something. Huge obstacles here were technology and the unknown. I had no confidence in launching a product. But you just have to do it and see what works. The most important product launch was my first Power Editor training course. I didn’t even have a product when I first launched it as pre-pay. And the sales — amazingly to me at the time — came in. Without that experiment, I’d have no idea that the focus on my business should be training courses. I recently launched the update to the Power Editor course, and I’ve launched others and have many planned for the future. Monthly Recurring Revenue: While the courses are great, they represent one-off purchases. As a result, I’d see big spikes and valleys in revenue. To fix this, monthly recurring revenue was necessary. The Power Hitters Club was launched. This allowed me to create a private community for those most engaged at $97 per month. 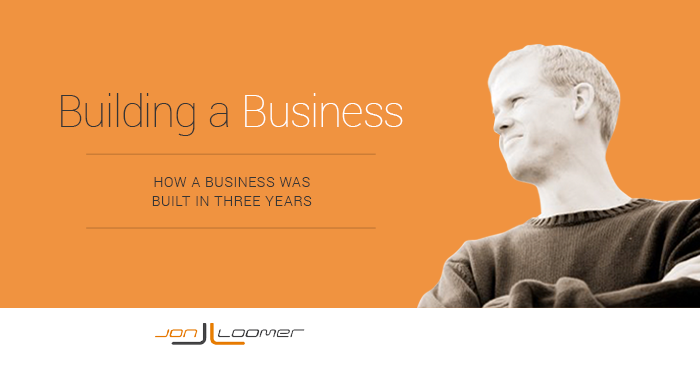 It’s been the glue for my business. Investing: I once prided myself on spending so little in the first year of my business. So, so stupid. Doing it right costs money. Software is needed. Advertising is required. It’s not unheard of for me to now spend $10k in a month on my business. Growth doesn’t happen without investing. And that monthly expense will continue to increase if I want this business to keep growing. Delegating: You can’t do it all yourself. Stop thinking you can. That’s just the start. More people will be needed. Scaling: The systems I had in place a year and two years ago could never sustain my business now. I outgrew AWeber in favor of Infusionsoft. I outgrew Premise in favor of Customer Hub. I outgrew unpredictable webinar software for GoToWebinar. But it was also important to create products that could be served to hundreds or thousands of people. There was no way I could help that many people with my old products. Planning: This business is constantly evolving. My business manager keeps me on task. Standing still is dangerous. The future consists of more public speaking, many more training courses, masterminds, an agency and software. Don’t quit, Alan. Don’t stand still. Fail like crazy. Experiment. Find what works and what doesn’t. INVEST in your business. Hire people to help you, even if it’s one part time. Create products that scale. And if you can, create a TON of content. What’s your story, and what advice would you give to Alan?